Despite our knowledge of the myriad risks involved and much to the disdain of some of my fellow cat lovers and most animal care organizations, our quintet of cats enjoy the outdoors. We keep them in at night, but during the day they are free to come and go. We understand this is not only detrimental to their health but to the health of any variety of critters who exist around our house, namely birds, lizards, rats and mice. Today’s special is the latter. This morning, I knew something was up when I saw Ranger trotting across the yard with cat Jiggy in pursuit. It’s always the other way around. So when I joined them, sure enough, I discovered that ever-protective Ranger had taken a mouse away from Jiggy and when demanded by me dutifully dropped it from her mouth on the grass. It seemed dazed and in shock but not suffering any external wounds so with Susan’s help I secured it in the shoe box I keep handy to serve as a potential recovery room. Not more than a half-hour later Susan came in to alert me that Ranger was under the patio table guarding yet another mouse Jiggy had found. At first look this one seemed to have expired, but then I saw its tiny lungs fill with air and deflate and so now our Mice Hospice has two residents. Given how relatively unscathed and alert the last cat-caught rodent seemed that I offered sanctuary to, only to be found dead the next morning, I’m not fooling myself about the prognosis for this pair — especially the second one (at the bottom of the snap above). If they recover, I’ll be pleased to release them deep into the front yard ivy with the hopes they’ve learned a valuable lesson. But if they go to their respective ends in the near future, at least they will do so with some dignity in a warm quiet place stocked with some water, walnut bits and cat kibble should they find themselves in need of a drink or a nibble. UPDATE (12.27): Looking better! Checked on them at 7:15 a.m. and was pleased to find them improved from when I’d checked on them before going to bed last night. Plus, they’d eaten some of the walnuts and drank from the water bowl and pooped plentifully. Both an appetite and poop — especially bloodless poop — is a good sign that internally they’re not damaged (or at least not badly). I’m still maintaining a healthy skepticism, but the fact that the little one (on the left below) has rebounded given how badly beaten up it was when I found it is pretty amazing. I’d bet it has helped both tremendously that they had each other for company. UPDATE (3:51 p.m.): As can be seen in this brief clip, the larger one certainly demonstrates some protective tendencies. PS. They love cheerios. Not sure of the species… deer mouse, perhaps? UPDATE (11:28 p.m.): After a wonderful night out with friends from San Francisco, we came home to find the smaller seemingly worse-off of the two mice had escaped the box through a hole it gnawed in one of the corners. 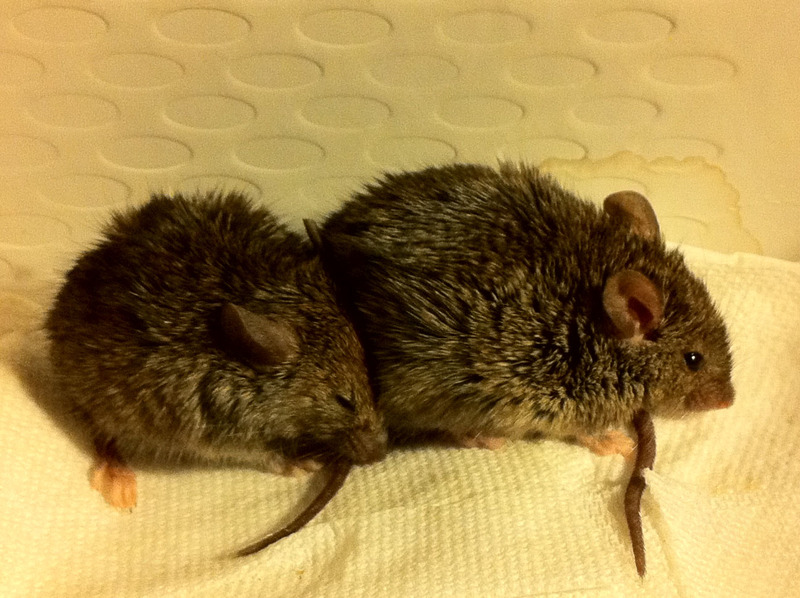 So now there’s a mouse (and/or its parts) either in the house or in one of the cats’ bellies. Probably a bit of both. 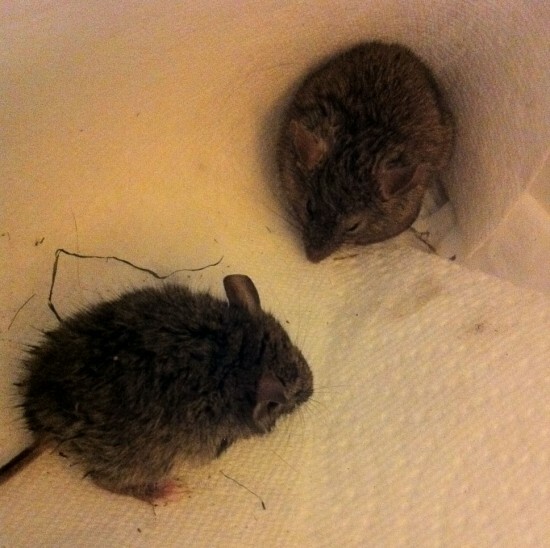 More bad news: the larger seemingly better-off mouse stayed behind in the box largely because it is no longer better-off. It has taken a drastic turn for the worse and I won’t be surprised if it does not survive the night. Sigh. UPDATE (12.28): As of 9 a.m. the whereabouts of smaller mouse is still unknown (I’m going to hope it found a way out of the house as easily as it found a way out of the box). The larger mouse is still with us. Despite remaining largely immobile with no improvement from last night, it has been installed in a chew-proof container (I’m kicking myself for not doing that in the first place with both critters). UPDATE (5:03 p.m.): Well, the remaining mouse ain’t through yet. I put some shredded paper into which it’s nested quite adorably, along with a small plush toy just in case it could use the softness as a surrogate for the one that got away. 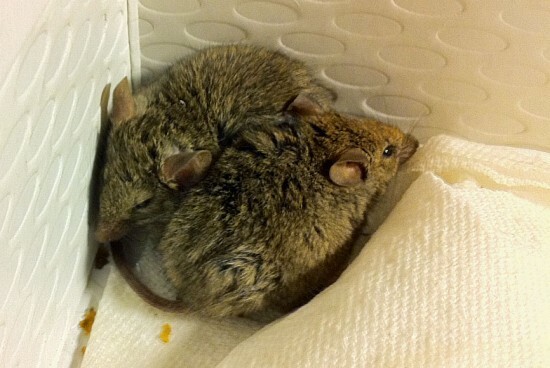 UPDATE (12.29): This may be the most resilient mouse I’ve ever encountered. Though it seemed to be knocking on death’s door — again! — this morning (hardly reacting when I picked it up by the tail), at 3:35 p.m. it suddenly emerged from its shredded paper nest to move about and nibble on a cheerio. UPDATE (12.30): Amazing. Huge increase in activity today. At 1:45 p.m. it just finished another stretch that included lots of eating, moving, drinking, and exploring the perimeter of its enclosure trying to find a way out. If this doesn’t diminish release could be as soon as tomorrow. This entry was posted on Monday, December 26th, 2011 at 1:27 pm and is filed under animals, nature, updated. You can follow any responses to this entry through the RSS 2.0 feed. Both comments and pings are currently closed.